A visit to the The Patchwork Café in Lyon 7, is a great way to combat the winter blues: it is relaxed, comfortable and colourful. 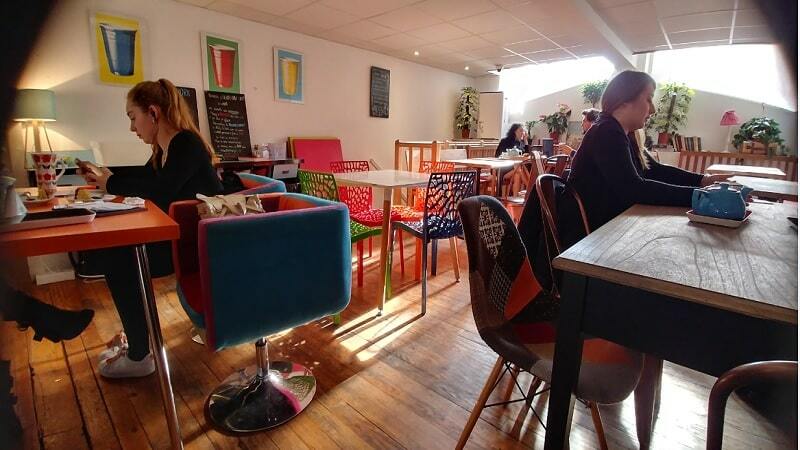 Lyon’s Patchwork Café is a Great Place to Hang Out. After spending a comforting two weeks at home during Christmas break, my return to Lyon was a little rough. The city ushered me back with clouds and rain and chilly breezes—not exactly the warm welcome I was hoping for. Sighing at the greyness outside my kitchen window, I knew that I needed a change of scenery. So I bundled myself up in as many layers as I could manage, texted my friend to meet me at a café I had heard about, and took off towards Lyon 7. Little did I know that my impending visit to the Patchwork Café, situated between Garibaldi and Sans Souci metro stations, would be just the thing to lift my spirits. When my friend and I stepped inside it felt like we were blinded by a burst of sunshine in the best way possible. Bright teals, yellows, and oranges popped out to say hello. The green plants hanging lazily over the balcony made it feel like an instant oasis. Around the room stood round wooden tables and square purple metal ones paired with a mélange of seating. From low sofas, to proper cushioned dining chairs, to seats that looked like they were salvaged from a retro high school cafeteria. It was like standing in a sleeker, more contemporary version of a room from a Dr. Seuss children’s book. Curious yet comforting, bold yet inviting, each seemingly random element came together in harmony. 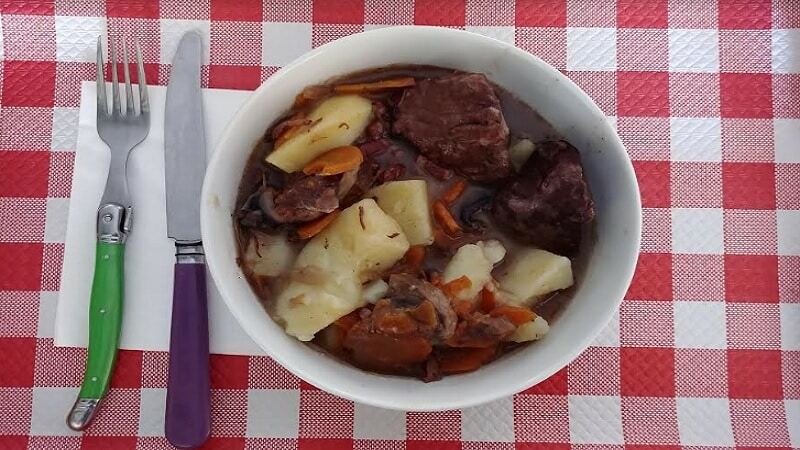 The beef bourguignon was a classic and delicious choice. Finally we teared our eyes from the walls and eagerly consulted the menu. The café offers delicious food as well as tea and coffee throughout the day. Since it was noon I opted for the boeuf bourgignon from the rotating lunch menu. It was a classic and delicious choice. The tender meat, potatoes, mushrooms, and thinly sliced carrots enrobed in a steaming, savoury broth warmed me up on the inside. My friend offered a bite of her almond cake which was very moist and not too sweet. Satisfied with my meal and lounging among the retro décor, I felt so relaxed. I was so happy there and I promised myself to return often. With its cheery atmosphere and yummy meals the café is the perfect place for collaborating with coworkers or challenging a friend to a game of chess. Sometimes there are nightly events, which in the past have included art displays, music, and wine tastings. The next time you find yourself falling into the winter blues, do yourself a favour. Grab your coat and a good book and hop over to Lyon 7. Let yourself soak up the sun at this home away from home. Food solves so many problems. Bon appetit.